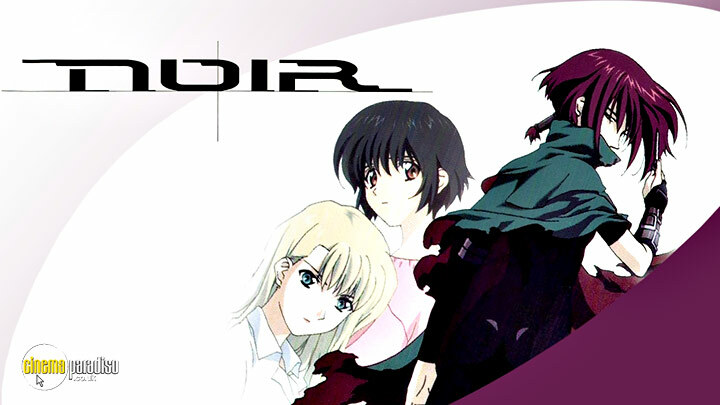 Noir is a Japanese anime television series. Premiering in 2001, the series follows two young female assassins. Together, they set off on a journey to uncover the mysteries of their past. What begins as a hint at a familial relationship between the two, grows more and more as the episodes go on. Their adventures become more harrowing, as the secret organisation Les Soldats is always one step ahead of them. The series is the first in the Noir trilogy. Words on a computer screen. Those are the bait that propel professional hitwoman Mireille Bouquet on an odyssey of death and vengeance, into the icy blackness of her own soul. There she will find Kirika Yumura, a young Japanese amnesiac whose killing skills are as deadly as Mireille's, and whose missing memory may unlock the mystery of Mireille's own past. In uneasy partnership, never truly trusting each other, they embark on a journey through the ultimate darkness, searching for a truth that they know will mean their deaths. The mysteries deepen as professional assassins Mireille Bouquet and Kirka Yumura, now working together under the code name "Noir", must mesh the plying of their trade with the search for the enigmatic link that binds their hidden pasts. Is there someone out there who already knows? And if so, is it the same entity that's been playing a deadly game of cat and mouse with their lives since they first met? The secrets, and the body count, continue to rise in the second stunning volume of Noir. The word is out on the street: Noir is back in business, and any life can be bought for a price. But Mireille and Kirika's latest case takes on an unexpected wrinkle when someone else beats them to their first target. Who is this unexpected competition, and what links does she have to the mysterious Soldats? If you thought our first two femmes fatales were deadly, just wait 'til you meet Noir's third lethal lady of the night. Her name is Chloe, and her calling card is murder. Kirika and Mirielle must fight for their lives both at home and abroad as the action explodes across the globe. Yet even as the mystery surrounding the origins of Noir slowly begins to give up its clues, the two assassins find themselves being driven apart, both by conflicting emotions and conflicting goals. As the secrets of Mireille's past are unearthed from their graves in Corsics, Kirika's own grim history slowly begins to reveal itself. The revelations bring no conclusions or happiness; only murder and death. With a bullet to the head, the truth is revealed. Friends become foes, partners become enemies. The twisted weave of the fabric of fate becomes a shroud of death as Mireille and Kirika find themselves facing their most deadly challenge. The darkest ritual of the Soldats has begun in the place that time forgot. All the mysteries are solved that originally sent Mireille and Kirika on their journey. But in the final battle, who will live and who will die?